Transport your senses to the beaches of Thailand with this light, aromatic coconut rice paired with refreshingly zesty lemon grass. 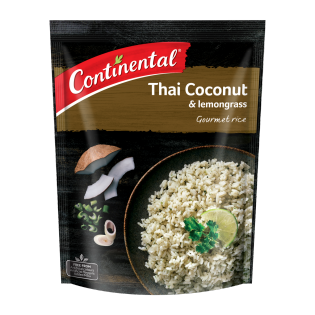 This exotic Thai Coconut & Lemon Grass Rice will make your favourite Asian meals all the more enjoyable. Create your own twist by stirring through some sliced cooked chicken, snow peas and top with coriander and chopped chilli. Hi, this product is still available in Woolworths & Coles. Did you want to check with your local store manager or give the supermarket helpdesk a call? ready in less than 15 minutes. great coconut flavour. easy to fit into a balanced diet.